Traveling with breastmilk is a top concern of mothers - especially those who have to go out of the country and still want to bring home their milk. I have previously posted tips on traveling and expressing milk without baby and how to transport breastmilk via air (Asian travel). 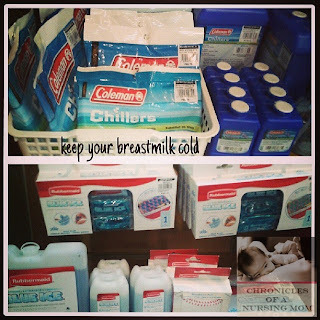 My own experiences in transporting breastmilk involved air travel, dry ice and regular ice packs. 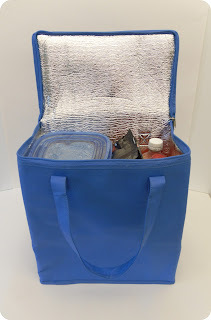 For this post, I will share some tips on traveling with refrigerated breastmilk with travel time of about 6 hours and traveling with frozen breastmilk using dry ice. On whether you can handcarry your milk or not? We do not have set rules. If you do ask the airlines, they will tell you that you have to check in your milk. I have traveled to Davao City, Cebu, Caticlan and hand carried my breastmilk. So far so good, no issues. I didn't even have to declare the liquid as breastmilk. I just placed everything inside my handcarried bag and laid them on the x-ray conveyor. Transatlantic or transpacific travels are more challenging. I've successfully brought home frozen milk from the East Coast - all frozen solid when I arrived in Manila. It takes some planning but it is very doable. Visit the website of your airline. Check their regulations for traveling with breastmilk. If there is none, print this document from the TSA and bring it. Remember though that the TSA is a US agency and each country has their own rules/regulations. However, for countries without specific rules on breastmilk, I've found that the TSA rules have a persuasive effect on airport officials who decides whether or not to let you hand carry your breastmilk. I haven't seen an insulated box locally available but I have seen an insulated bag in S&R. Next, freeze your breastmilk and wrap them individually with cling wrap. After wrapping with cling wrap, wrap with newspaper. Why do I do this? My parents often send us meat from Davao City and it is always wrapped with newspaper to keep the cold in and make it last longer. I wrap the milk bags in cling wrap first because I don't want to milk bags to get dirty because of the newspaper. Note: If you only have refrigerated milk, dry ice will cause it to freeze so no problem with transporting refrigerated milk using dry ice. Dry ice is P112 per kilo and minimum amount is 1 kilo to purchase. However, I suggest you call ahead to ensure that there is dry ice available for sale before you pick-up. Remember that dry ice subliminates (solid turning to gas) so I suggest you pick up the dry ice the day before you leave. I also suggest that you read these FAQs about dry ice from these 2 sites: ADryIce and DryIceInfo. Aviation rules in transporting dry ice. Full pdf here. Check your airlines' rules in transporting dry ice. I usually find the rules by googling "dry ice" + "airline name". Generally, what is allowed is 5lbs of dry ice. But buy more because dry ice subliminates fast. When you purchase dry ice, don't store it in your refrigerator. Store it in a cooler outside your house or in your condominium's balcony. Dry ice subliminates into carbon dioxide and may cause suffocation if stored in an unventilated area. Dry ice also burns so handle it carefully and use gloves. When packing, you need to make sure that there is no empty space to lengthen the life of your dry ice. Pack empty spaces with wadded newspapers. The frozen milk bags (individually wrapped in cling wrap and newspaper) are stacked and layered like bricks then the dry ice goes on top (because cold sinks). 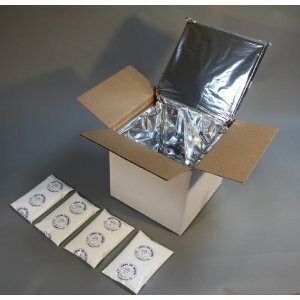 If you are using an insulated box, seal with masking tape only in the middle and tie it up. If using an insulated bag, don't completely zip up the insulated bag. Put in a box then seal only in the middle. It is important that you do not completely seal the package. Again - dry ice subliminates and the carbon dioxide needs a place to escape - otherwise, it will explode. Mark the box with dry ice and upon checking in, tell the check-in counter person that the package contains dry ice. Can you put the box inside your suitcase? Hmm... unless you don't completely seal your suitcase then you can. Remember, you cannot completely seal the container with dry ice as it may explode. So it is best to separate it from your other baggage so it will be properly marked and tagged.